Introducing our New Republic Gun Safe series, assembled right here in America. Compare our top-of-the-line Republic Gun Safe Series with comparable products sold by our competitors – and you’re in for a big surprise. 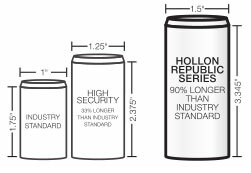 Our Republic Gun Safes are reinforced with 300% thicker steel than other leading brands. It’s like keeping guns inside a Sherman tank. Torch Resistant Fire Rated for 120 mins of Protection at 1400°F. Far Exceeds California Department of Justice Regulatory Standarts for Residential Security Containers. (14) 1 1/2″ Active Chrome Plated Solid Steel Live Locking Bolts. 1/4″ Solid Steel Plate Added to the Entire Door for Pry Bar Resistance. (1) Full Lenght Adjustable/Removable Shelf Reinforced with Steel Beams for Maximum Weight Capacity. Top Shelf Designed to Accomodate Long Guns. Hollon Safe backs all our fireproof safes with a lifetime warranty against fire. We will gladly replace and Hollon Fireproof Safe that has been damaged in a fire with the same or a comparable model to include all freight costs to the original address of purchase. Customers will be required to supply all requested documents to an authorized Hollon Safe representative prior to replacement.